Is Patient Engagement with Medicine different than World View? The first Chairman of Medicine at John Hopkins Medical School was William Osler. He taught that a physician must be broadly knowledgeable about the arts and culture in order to make a difference in engaging the patient. This has come into play in the republican primaries for the first time, regardless of other requirements. When I was a freshman medical student we had a special course on Inborn Errors of Metabolism. I think it was a first, given a new and energetic Chairman of Biochemistry from Harvard. Nevertheless, over the next decade, the influence of “Oslerism” was fading, to be replaced by the concept of a British physician, Archibald Garrod (1857–1936), in the early 20th century (1908). He is known for work that prefigured the “one gene-one enzyme” hypothesis, based on his studies on the nature and inheritance of alkaptonuria. His seminal text, Inborn Errors of Metabolism was published in 1923. Some years later I learned that the selection of students entering was weighted in success with organic chemistry. Jump up^ Vernon, Hilary (Jun 2015). “Inborn Errors of Metabolism: Advances in Diagnosis and Therapy”. JAMA Pediatrics. ^ Jump up to:a b c d e f g h i j k l Applegarth DA, Toone JR, Lowry RB (January 2000). “Incidence of inborn errors of metabolism in British Columbia, 1969-1996”. Pediatrics 105 (1): e10. doi:10.1542/peds.105.1.e10. PMID 10617747. When I entered my third year of medical school, I had a huge awakening. I was now engaged with patients at Detroit Receiving Hospital. It was not unlike Cook County, LA County, Charity Hospital, King County or Belleview Hospital. This was a year before the Detroit riots. Receiving Hospital (later Detroit General) had a large population of indigent patients and was a trauma center located adjacent to skid row. There were students who looked down on the patients, many on welfare, and who took a taxi to the hospital. Most of my colleagues did not have that view. However, I would guess that my view was transcended some time later when I recall students concerned about “racial balancing” for entry to colleges. I saw the victims of gun, knife and other violence in the Emergency Room (ER). On one occasion, the entire surgery staff was called out of the weekly Grand Rounds to attend to 3 cases with massive bleeding in the ER. One of the cases was presented the following week with a discussion of whether the patient should have been taken to the operating room instead of handling the emergent case in the ER. I also recall a woman who might have been 45 years old who was extremely anxious and had had 5 divorces. Nobody came to visit her. We were taking her blood pressure when it spiked very high. My classmate might well have said holy smoke and ran to the library to check things out. She had a very rare occurrence of pheochromocytoma, a tumor of the adrenal medulla that secretes adrenaline. It was probably also a factor in her social history. It was the first such case to be seen by the Chairman of Surgery. I don’t know that preparation in the great city hospitals has changed. It is an important experience. I did see some anger expressed by patients in the ER, mainly related to the life experiences of the patient. In my 20 years at Bridgeport Hospital, there was a large admission population from “Father Panic Village”. I recall vividly a patient saying to me, when he learned my last name is Bernstein, get away from me. Over the years, not that much has changed. There is a much larger uneducated, unemployed, and ignorant population that has no hope of a future. It is most disconcerting at this time because they are bereft of a dream, and they don’t participate in our society. Moreover, large disparities influence voting patterns and also the use of tight public resources. It would be difficult for me to consider this to be unrelated to an emerging world crisis that we are observing today. There is an increased downward pressure on the lower class with a vanished middle class. The entering well prepared medical staff is inundated, but more skilled at the inadequate medical information systems they have to use. There has been emigration to the UD for decades, but now we have more openly advocated do not come unless you have value to provide. We are in the midst of a Middle East crisis, and despite economic recovery since the Wall Street collapse, there is a “doomsday” chronicle. Emma Lazarus wrote “Give me your poor, … and your huddled masses yearning to be free”. TS Elliott wrote “The Hollow Men” in 1925, post WWI . We remember “This is the way the world ends. This is the way the world ends. Not with a bang, but a whimper. I hope that it hasn’t come to that. Actor Robin Williams with wife Susan Schneider Williams in August 2009. Robin Williams had been planning to undergo neurological testing the week before he committed suicide last year, and likely only had three years to live his widow said earlier this month. 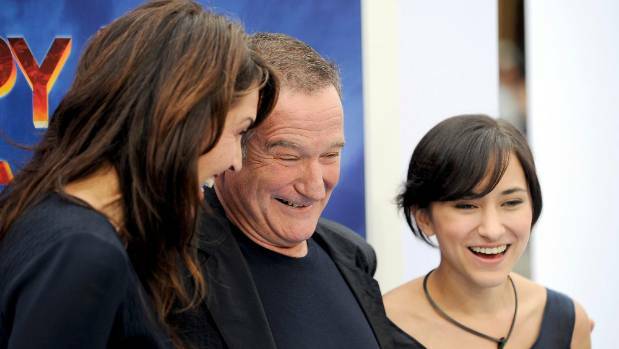 Robin Williams , wife Susan Schneider and their daughter Zelda Williams at the premiere of “Happy Feet Two” in, November 2011. 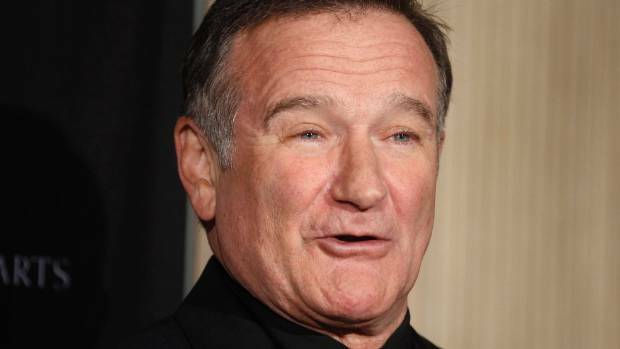 Robin Williams, then 63, had been seeking treatment for severe depression. But last week, his widow, Susan Schneider, revealed that her husband was suffering not only from Parkinson’s disease that had been diagnosed three months earlier, but also from Lewy body dementia (LBD), a progressively brutal illness that affects memory, movement and motor skills, and causes severe psychiatric symptoms. Strikingly, LBD – sometimes referred to as dementia with Lewy bodies or Parkinson’s with Lewy bodies, depending on symptoms – is the second-most common dementia after Alzheimer’s and affects more than 127,000 Britons. Yet most people have never heard of it. “This disease is a sea monster with 50 tentacles of symptoms that show when they want,” Schneider said. Williams suffered hallucinations, anxiety, depression, loss of motor control and problem-solving skills, sleep, balance and spatial awareness problems, and delusions. Schneider describes one incident just weeks before Williams’s death, when she was in the shower and he was standing by the sink. Lewy bodies are protein deposits in the brain, explains Professor David Burn, consultant neurologist and director of the biomedical research unit in LBD at the UK National Institute of Health Research (NIHR). Discovered by Dr Frederic Lewy, a colleague of Dr Alzheimer’s, in 1912, the deposits develop inside nerve cells (neurons) in the brain, interrupting messaging and causing neurons to die. A patient’s symptoms will depend on which part of the brain is affected. “When neurons die in the cortex, it causes dementia, but when it occurs in the brainstem, it causes motor symptoms (Parkinsonism),” says Burn. “LBD patients face a rapid deterioration in their cognitive, physical and psychiatric function, and it tends to progress faster than other dementias,” he says. When Paul Moynagh’s wife, Imogen, couldn’t find her way from a cafe table to the counter on a visit to a National Trust house in Devon in 2006, he thought little of it.Paul, 78, couldn’t have predicted the confusing set of symptoms that Imogen, 74, would experience. LBD is often misdiagnosed as Parkinson’s or Alzheimer’s, and it took doctors almost seven years to confirm her illness. “Looking back, it began with little signs – loss of spatial awareness is an early symptom – but they were so inconsistent,” recalls Paul, a retired surgeon. First, there was a minor trembling in Imogen’s hands, then severe sleepiness during the day, along with spasms that made her right foot turn in when she walked. Then she developed depression and suffered panic attacks. By 2010, Imogen’s reasoning and planning skills were suffering – a key sign of LBD. Imogen, like Williams and many LBD sufferers, was initially diagnosed with Parkinson’s disease. “She began shuffling when she walked and her voice became weak, both symptoms of Parkinson’s,” says Paul. Meanwhile, her depression was getting worse, not least because Imogen was so aware of what was happening to her. When Paul Moynagh’s wife began experiencing hallucinations – a tell-tale sign of LBD – he knew that there was more to her illness than Parkinson’s. “She would see people in the windows of the conservatory and in our floor – which we made look like natural stone – she saw figures speaking to her. “In my desperation, I would spend hours Googling Imogen’s symptoms until I stumbled on Lewy body dementia,” he says. June Brown, who plays Dot Cotton in EastEnders, lost her husband, actor Robert Arnold, to LBD in 2003. Now, the only way to know that someone had Lewy body dementia is when a post-mortem examination finds Lewy bodies in the brain. According to LBD specialist Ian McKeith, professor of old age psychiatry at the Newcastle University Institute for Ageing, LBD often gets misdiagnosed because doctors don’t know which questions to ask. He is in the middle of a study funded by the NIHR to develop a diagnostic toolkit for use in NHS practices. Although there is no cure for LBD, doctors can treat symptoms using drugs that work on the brain’s messaging system, says McKeith. But correct diagnosis is essential. “If antipsychotic or anti-Parkinson’s drugs are given to patients with LBD, they can be fatal,” he says. “We were living a nightmare,” Susan Schneider said of Robin Williams’s final months. McKeith says one study found that when carers looking after someone with LBD were asked to rate their quality of life on a scale of zero to one (where zero was as bad as it could be), one in four rated it as below zero. “Underneath it all, she is still the lovely person that I married,” he says. Oncologists, whether they like it or not, must develop some psychological skills if they ever hope to master the art of caring for people living with cancer. Among our many duties we serve as therapists to those diagnosed with, living with, and dying with cancer. Therefore, it behooves us to recognize the benefits of communicating our regard for our patients’ lives and our concern for their anxieties. Compassion, defined as sympathy for another’s woes and a desire to ease them, is succor for fear. Compassion creates a bond of trust between doctors and patients that soothes painful emotions and provides support during difficult times. Given the oncologist’s busy schedule, is compassion a superficial gratuity or does it require training and execution in order to be meaningful? How do we, who have no formal training as therapists, learn to value it for our patients and use it successfully? The eminent psychologist Carl Rogers, known as the father of client-centered therapy and the author of the two quotations above, would be a welcome addition to the oncology staff. His philosophy of therapy emphasized letting the client (his term for patients) direct the course of discussion as a means toward deeper understanding, and he emphasized the need for the therapist to follow certain guidelines. I believe his method fits perfectly with our need to learn the skill of compassion. Let’s look at the three qualities Rogers requires the therapist to possess and how they can be used in the oncology clinic. 1. Congruence, also known as Genuineness. This is the ability to be real, to be transparent, with no façade of self-importance or didactic formality that could build a wall between the patients and us. In order to express compassion to the needy, we must project an honest image of ourselves; we must drop the mask hiding our true feelings. For example, if I’m having a bad day, I should admit it rather than act frustrated for no reason. If something funny comes to me, I will share it. I want to let my patients see me for who I truly am—a fellow human being, with no appetite for phoniness. 2. Unconditional Positive Regard. Just as it is named, this means accepting patients for who they are and eliminating any prejudices or disparaging feelings that threaten to surface. We all have personality quirks, shortcomings in communication skills, imbalances, and hidden agendas. We must not let anyone’s flaws or foibles poison our professional relationship. No matter how unpleasant, annoying, nervous, or angry our patients are, we shall respect them as unique individuals and not let them influence us in a negative, unhelpful way. Inside all of us is a yearning for respect and love. Thus, compassion is meant to be shown to all—no favoritism. 3. Empathy. Dr. Rogers believed that the therapist must be able to accurately interpret the inner emotions and struggles of the client “as if one were the person, but without ever losing the ‘as if’ condition.” Oncologists who are able to see a situation through the eyes of their patients will succeed in their mission. We must be able to “enter another’s world without prejudice,” and the best way to do this is by being perfectly comfortable in our own skin to the point that we can block our inner reactions and focus entirely on what it must be like to be the patient. Empathy will never fail to bring forth compassion. In my opinion, compassion in the oncology clinic is 90% listening and 10% speaking, and it can only be given by those who have learned how to leave themselves out of the picture. Our opinions, biases, peculiarities, and attitudes are immaterial to the job at hand. When their lives are on the line, our patients want to know, “Does my doctor really care about me or not?” May we never be ignorant of that unspoken question, and may we always be ready to reveal the happy answer, again and again. I have read other posts by Dr. Hildreth, and each and every time I have come away with a better understanding of what it means to be in this profession of treating cancer patients. I admire Dr. Hildreth’s philosophy so much. The first time I ever read one of his posts, I said to myself (and to some of my employees) “Dr. Hildreth is the kind of oncologist I would want to have if I ever had cancer myself”. Thank you so much, Dr. Hildreth, for being a beautiful human being and oncologist.